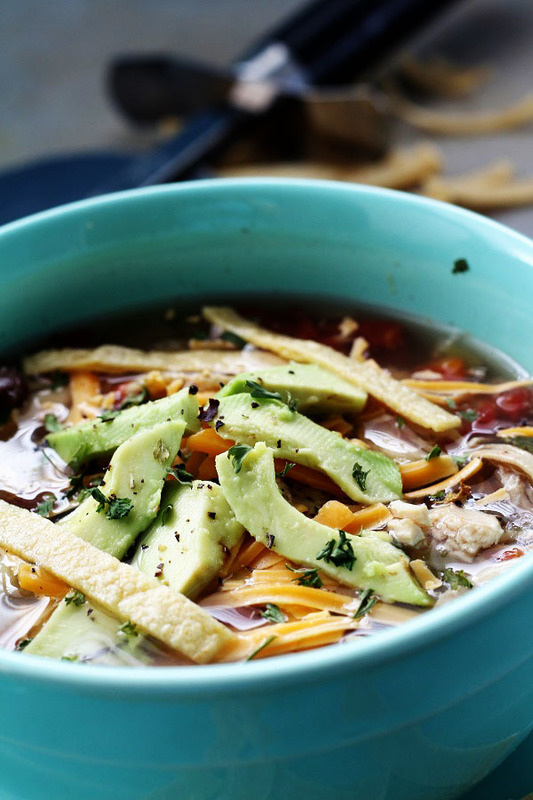 Warm chicken avocado tortilla soup is wonderful on a cold winter day. There is something about warm soup on a cold day that just makes you feel better. I know that it seems to warm me up inside, and I just feel happier. 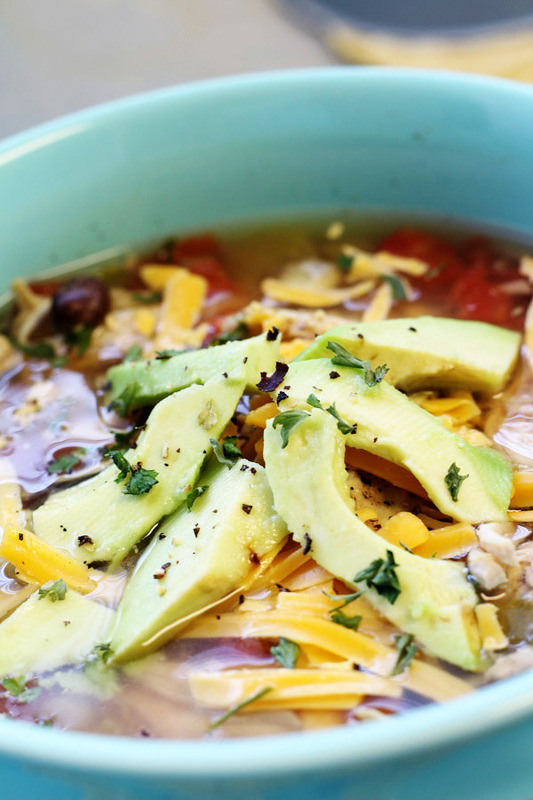 The thing that is so fun about this chicken avocado tortilla soup is that you can add avocados, corn tortillas, sour cream and extra lime juice if you like. Big chunks of chicken, black beans, corn, and tomatoes make this a pretty healthy meal. The spices make this wonderful. I grew up in the country, and when I was in high school, there where 65 in my class. My kids can not even imagine that! They all went to a very large high school. Like about 1500 students. Sometimes I get the opportunity to go back and visit the school. The building has changed a little because they have added on here and there. In some ways it seems like I was just there yesterday, and in other ways, it feels like it was forever ago. One thing that I do remember, is that when I was young, my mom worked outside of the home. We had soup out of a can, and we never got anything like chicken avocado tortilla soup. I don’t know why I didn’t make things when I was younger, we would have all really enjoyed many of the recipes that I make now a days. I realize that when you are younger or at least for me, I didn’t think of others, because I was too busy thinking about myself. I now know that I enjoy serving others and I also like eating good food. Isn’t it so interesting that we use food for parties, and for when people are down and out, we use food to try and cheer people up, and we also use food for special occasions. Food really does bring us together. We have new neighbors that moved in and the first thing that I thought to myself was I need to make them something, I wonder what they would like to eat. Also, my daughter is going to an auction tonight and I thought to myself, I wonder what people would like to buy at the auction? When you go shopping, they make food look so appealing that you cannot control yourself and you must buy some of those wonderful looking cup cakes or even cookies, they are too hard to just look at and not buy. Then there are donuts, there are those that makes these wonderful looking donuts, and then they put sprinkles on top or cream filling inside and then we can not resist them! Yum! I think I am making myself hungry. Then sometimes, one just needs some healthy food, and we do not want food that is sugary or fancy, we just want some good old meat and potatoes or even a delicious chicken avocado tortilla soup! One of the best things about this soup is that you can put it in the crock pot and forget about it while you get some other things done. Now are we great multi-taskers!?! My 2 year old grandson says “abocaboe” soup. Ha ha what a cutie! Try it today and let your creative juices flow; that way you can adapt this recipe to fit your family. Also if you don’t care for black beans, put in any kind that you like. Most important, don’t forget the toppings! 1- If you like oregano, you can add 1 teaspoon, as it makes it a little more flavorful. 2- Make sure that you add your avocado right before serving so that it will not go soft and dark. 3- You may want to add small pieces of chips that you have crushed to the top of the soup for time sake. Place whole chicken breasts (you can shred them after they cook), and chicken broth into a large crock pot. Add tomatoes, onions, garlic, chili powder, cumin, oregano, paprika, and about ½ tsp of salt and ¼ tsp pepper. Place lid on crock pot and cook on low for 6 hours or high for 3 hours. Remove the chicken and shred with 2 forks, return to crock pot and add black beans, corn, cilantro, and lime juice. Using a pizza cutter and a cutting board, cut corn tortillas into strips, about a ½" wide. If you want you can add them the same time as the beans and corn, but they do go soft. Garnish each individual bowl to the liking.